With all the beautiful details being added to today’s modern and contemporary lab coat styles, it’s difficult to decide on a favorite design. Lab coats for women didn’t even exist until the last decade, and today there are a number of different designs to choose from in the world of medical uniforms. These new collections of lab coats are special because every coat is so unique. They truly bring the elegance of a tailored suit or blazer, giving you a professional look that really speaks to the skill level and professionalism of the physicians who wear them. 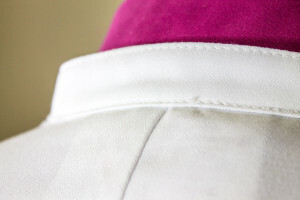 When I first saw the envelope collar of the Vera G. lab coat from Medelita, I immediately noticed the craftsmanship and detail that went into this unique design feature. I also noticed the impeccable sewing and construction of the coat – as you can see from the photo below, the seams of this exceptional lab coat are double reinforced. Elegant, tasteful, and functional. Does it get any better than that? This entry was posted in Lab Coats, Women's Lab Coats and tagged Lab Coats For Women on June 21, 2016 by Ariel Jacoby. Superbly ilmalinuting data here, thanks!